Warmer than stone, but with more personality than ceramic, brick is a unique flooring choice for bathroom installations. Once only used in exterior projects, today brick pavers are finding a home in many interior spaces due to their ease of maintenance, and numerous design options. The main concern with any bathroom floor covering is moisture penetration. From sink splashing to shower dripping, the bathroom is a wet environment, and you have to make sure that the floor is impregnable so that stains do not occur. Brick is a relatively sturdy and durable material, but unfortunately, it is also absorbent. In a bathroom, water can penetrate down into a paver and the surrounding joint lines. This can lead to the growth of mold and mildew. Staining agents will also be able to soak into the surface causing very hard to remove blemishes. In order to prevent this, a high-quality waterproof brick sealer will need to be applied to the surface of the floor after installation. You have to make sure that the sealer is applied to both the pavers and the grout lines surrounding them. To ensure that the sealer has been applied properly, wait until it has dried, then pour a few drops of water on the floor. If the liquid beads up, the sealing agent has created a secure surface. If it soaks into the brick, then it is time to apply another coat. In order to protect your floor, the sealer will have to be re-applied periodically every 9 to 12 months. Note: Brick flooring can generally only be installed in bathrooms that are at or below grade. It is too heavy for upper-level flooring unless the subfloor has been properly prepared and reinforced. In its natural state brick has a rough texture that provides ample purchase even when it is wet. This is enhanced by the grout lines that act like rows of traction across its surface. Combined, these two elements make brick pavers a safe option for bathrooms, which are often beset by splashing liquids and soapy slippery suds. If you choose to wax the surface of your brick bathroom floor then you are going to lose a lot of the traction benefits. This can be especially dangerous because of how hard brick is. If you fall, you could get seriously injured. For this reason, wax treatments are generally best left for brick floors in other locations. There are some sealers that can provide brick with a lustrous shine that will, to some extent, mimic the effect of waxing without causing the surface to become especially slippery. If you prefer a more rustic, natural finish, use a penetrating below surface sealer. This will protect the material, without glossing over its rough exterior. When it comes to brick flooring the simple things can often make a huge visual difference. 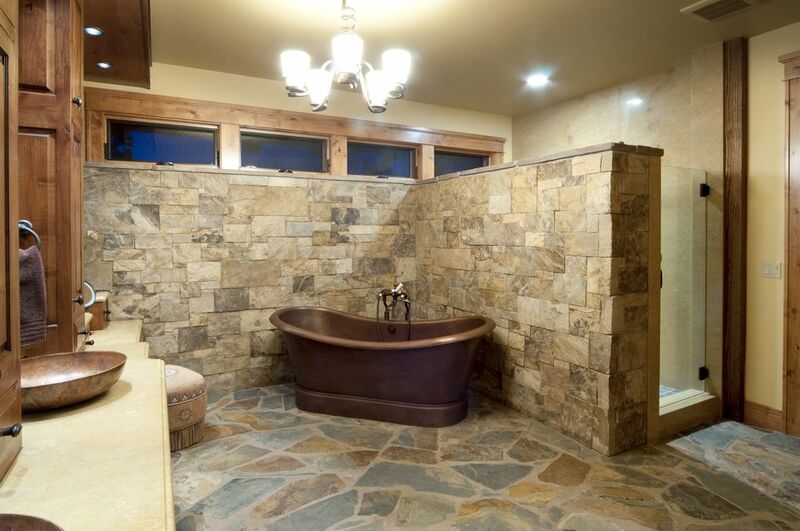 Wider grout lines, for instance, can give the room a rustic, rugged appearance. On the other hand very thin, sharp, precise grout lines will give the floor a stylish modern look. If you pair this with straight square angled pavers you will end up with flooring that has the character of brick, and the style of tile. Brick is also available in many different colors. You have the standard red hues, which can range in tone from dark maroon to soft beige with almost every variation in between. You can also purchase bricks stained in almost any color you can imagine. Playing with the variation of hues that are available allows you to create a unique bathroom floor. It is about $5 to $15 per square feet. Bargain products may be available at as low as $3 per square feet, although this may represent low-quality material that will degrade over time. This is the price per square foot of material, not the price of each individual brick. However, the real cost of brick bathroom flooring needs to be calculated over the life of the product. While initial material prices are low, brick can also last for dozens of years without needing to be replaced. It also represents a saving in maintenance costs as a brick bathroom floor will only need to be sealed once or twice a year, and then spot cleaned with a broom or mop.